If you want to get started with aquaponic gardening or want to upgrade your current system, a water tank specifically made for aquaponics is the tool you must have first. In this buying guide, I'll share with you essential details about fish tank and how the pick the best and right one. 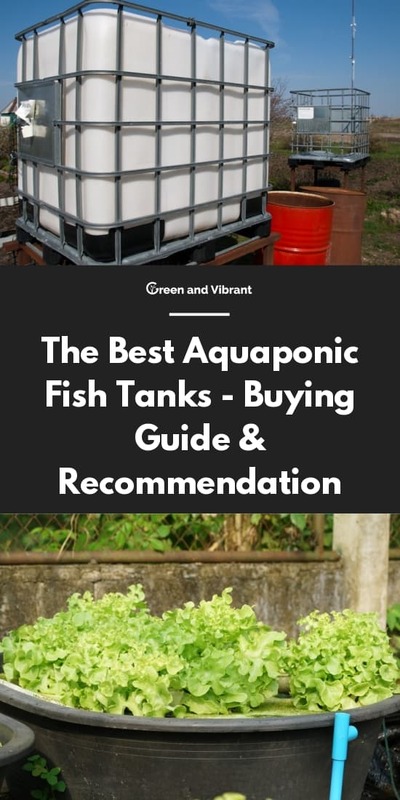 I'll mainly focus on true aquaponic fish tanks, which you use to raise edible fish for your family kitchen, not the decorating indoor aquaponic aquariums. What is an aquaponic fish tank and why do you need it? A fish tank is the essential component of any aquaponic system. The fish tank is the place where your fish resides. In an aquaponic system, fish wastes in a fish tank together with water will be pumped to plants beds, providing them with enough moisture and nutrients for their growth. Plants then absorb the nitrogen in the water and return with purified water to the reservoir. And this cycle goes on. So how to choose the right water tank that helps your fish thrive, makes the aquaponic cycle work more smoothly? And most importantly, you also want to have a tank that is safe for food consumption. Keep reading. The size of the fish tank is determined by the types and the sizes of fish raised. Commonly, for an indoor aquaponic aquarium which growers raise for fun or for decoration, the fish is small and only limited to aquarium fish. So these aquariums' size is really small and is often made of transparent plastic or glass. But for a really aquaponic system where growers grow edible fish that can feed their family, these are not small fish, and there is not just one. So for the tank size is really big. For these aquaponic systems, you need to have stability in your aquaponic tank. So if you can, try to get a no less than 150-gallon tank because a bigger tank can keep less fluctuation in temperature and pH level. This not to say that a smaller system is not great, but a large reservoir has a more stable growing environment. A larger reservoir can also contain more water and more fish; so unless you're a beginner, or limited by space, I think there's no reason why you should get a small fish tank. There are usually two types of the fish tank - round/oval or rectangular. But if you notice, the round/oval form is more preferred, and it is also a more effective form than a rectangular one. This is because, in round tanks, the water flow, and the fish and can circulate easier; Solid fish waste will be suspended in the water and will not stick to corners of the tank, which makes the anaerobic conditions happen easier. If you have some space, you should opt for a tank that is short in the bottom, but large on the top rather than one that looks like a funnel with a small top and large bottom. The reason for this is if the top of the tank is larger in size, you get more oxygen for the water and fish below. Fish really doesn't need much light; they want to feel safe and secure. That's why you need to have some kind of cover for the fish tank. Also cover can keep the fish from jumping out of the tank. So if your water tank doesn't have a cover, you should get one. A fishing net can make a great cover for your tank - light, easy to cover/replace. What's more, using a net, you can see through the fish and water below. The first and foremost thing is that the material must be waterproof, which seems so clear for a water-holding tank. But for large aquaponics tank, when you work with fittings, you may need to poke into or around the tank, make sure that you choose the material that is easy for you to use with the stuff that fixes water holes like marine-grade silicone sealant to block the water leakage. The fish tank also needs to be sturdy and heavy-duty to withstand the pressure from a great amount of water. It should be durable enough to last for years without replacing. And lastly, this material has to be inert, and not toxic as well, which I will explain below. Most growers have an aquaponic system to grow food; So it's not nonsense to say that the food-safe characteristic of a fish tank is very important. Metal containers should be eliminated first because it can leak unwanted toxic chemicals for your fish. Metal can cause the pH fluctuation for your system as well. Plastic is often used in a fish tank because it is lightweight and durable. But you should check the material first. Recycle plastic is not assured whether it can leach any toxic substances to the fish and the aquatic animal cultures in your water application. So it should also be eliminated. Opt for food-safe plastic like polyethylene HDPE or fiberglass, or IBC (Intermediate bulk containers) Totes (the container that is used to store liquid). These are safe for fish, plants, bacteria, and worms in the system. FDA-approved - Safe for containing food, fish, etc. The stock tank from Behlen Country is our top pick for an aquaponic fish tank. It has a very sturdy build with molded-in aluminum fitting and a 1¼-inch drain plug. This is a versatile reservoir that can be used as an outdoor pond, water storage, and Aquaponic fish tank. What's different from Behlen Country from other stock tanks on the market is their products are FDA-approved, which is a big plus for those who really care about food safety. But you may have guessed, for a better-built product with an FDA-approved certificate, the Behlen Country stock tank is a bit costly. However, you pay for quality and health safety these days. So if you have money to spend, Behlen Country stock tanks are worth it. If you need a fish tank for aquaponics, I cannot help mentioning the IBC Tote. It makes a great aquaponic fish tank. It is food-grade and awesome for storing water, liquids, fish well. IBC Tote has grown popular among aquaponic growers recently. There have been some excellent guides on how you can build your own aquaponic system from IBC Tote. You can check out this tutorial. 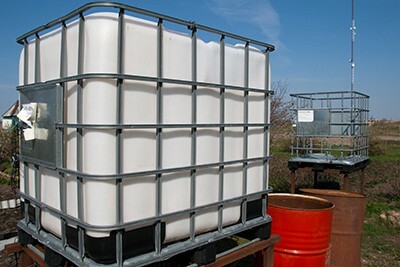 This IBC Tote from Duda Diesel can store 275 Gal, and it comes with the metal cage. And there is a metal pallet to make it easy for you to move around. This product has a 2" valve opening at the bottom and a hole on the top with a lid. To have a larger opening surface area, you may need to cut at the top by following the guide above. So if you are looking for a durable and food-grade tank for your aquaponic systems, this product is another great choice to have. Rubbermaid is a reputable food and water storage in the USA. And their stock tanks have also been favored by lots of aquaponic growers. This is such a sturdy and weather-resistant stock tank with structural foam construction. Down below there is a drain plug to make it easy for you to empty, clean, and change the water. There are various sizes that can fit from small to large-scale aquaponic growers. This tank is made from polyethylene, which does not contain BPA and phthalates and is recommended for gardening and storage use. However, there has been some wide debate about Rubbermaid Stock Tank product whether it is food-grade or not. And truth be told these products do not have a food-grade approved license. This can be the registration cost is high or different materials used, or manufacturing practices make it not approved. That's their story. Though, it's still used for lots of traditional gardening and aquaponic purposes because of their good price and durable material. However, if you put food-grade criterium on top, you should look elsewhere. High Country Plastics is another USA manufacturer that makes food-grade stock tanks. But it is not as popular as Rubbermaid and Behlen Country when it comes to aquaponic tank. And there are several sizes of tanks to choose from 35 to 700 gallons. This forest green stock tank can accommodate 155 gals of water and is made from food-safe and weather-resistant poly. There is a 1 1/4" drain plug at the bottom. This is another good choice for aquaponic growers. But personally I don't see it as sturdy as the Behlen Country, and that may explain why it's not as costly as the Behlen Tanks. Choosing an Aquaponic fish tank is not a step that you should be taken lightly because it's the tank that you'll use even for years. And I'll go in-depth to help you with the top aquaponic tank on the market. To sum up, if you really want to have quality and food-grade aquaponic stock tank, I'll recommend the Behlen Country. Their products are sturdy, stable, and safe for your fish. IBC TOTE is another awesome choice for you to set up an aquaponic system. However, it'll take more efforts to build one from IBC TOTE. But it has so much to do it yourself just like many aquaponic growers have done.